Let’s make our example more interesting. Suppose we would like to see all orders for USA customers. For each order, we want to see the name of customer, order date and sum. All result rows must be sorted by the order date. Here is the point where you can see how EasyQuery can simplify the process of query construction. 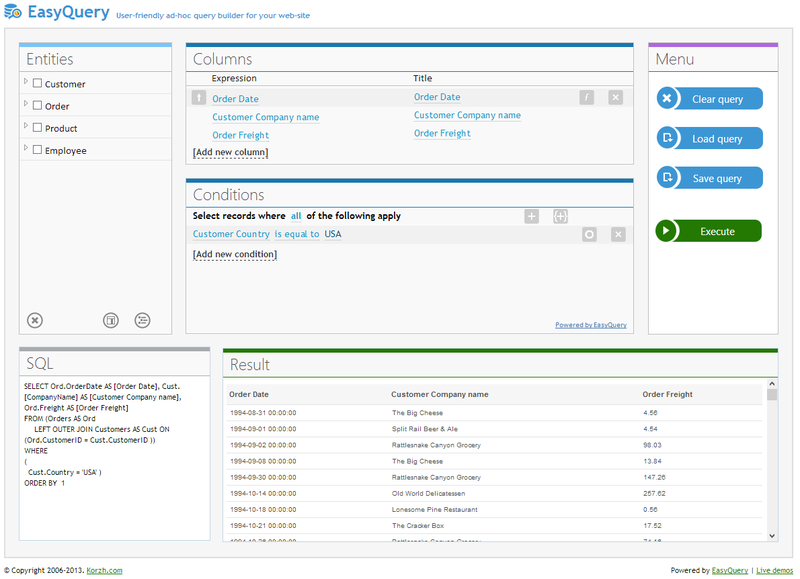 All you need to do - is to add necessary columns into Columns panel and set the sorting order for Order date column. EasyQuery will take care of the rest: tables joins, correct aliases for tables and columns, etc. So, just click on “[Add column]” link, select Order | Date from the menu. Then repeat this operation for Customer | Company Name and Order | Freight attributes. Finally, click on the first button in Order Date column row and select “Ascending” from the drop-down list.